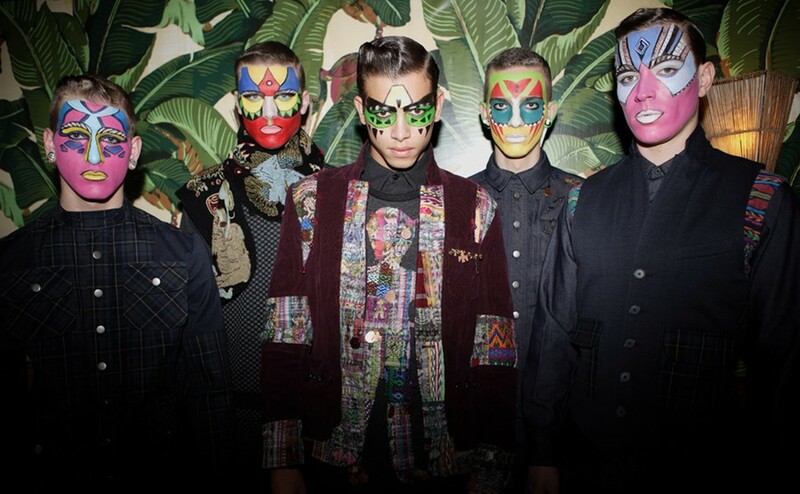 In a presentation full of colour, texture and print, Petrou Man's A/W11 collection offered a modern take on tribal aesthetics and continued evolution of the Petrouman warrior in to its fourth season. The collection took its inspiration from various tribal elements of Indigenous people scattered throughout the world and from the work of photographer and illustrator David Gomez. In a seamless evolution on previous seasons, Nicolas Petrou combined this heady cocktail of influences to create an individual collection of re-imagined vintage and heritage, one of a kind pieces. Here, the Central Saint Martins graduate mixed classic menswear shapes with vintage hand embroidered materials, oxidised charms, beads and paint customisation for dazzling results. Throughout the course of the hour long presentation, the audience explored the multi faceted looks and were transfixed on the beauty of Petrou's eye for detail. Dazed Digital: There was a definite continuation of themes introduced during S/S11. Were you already thinking about AW11, when designing the previous collection? Nicolas Petrou: Not really. It is a natural process for me, I don't think about it too much and certainly don't plan things. There will always be a continuation from season to season. An underlying thread or theme will always be present. It is always fluid. Everyone comes together at the last moment. Until today, when everything came together even though I knew how it would look, no one else did and previously it was just pieces. The team met each other together, then the hair, the make up and the styling all came together. DD: Could you talk us through the tribal influences on the collection? Nicolas Petrou: Exactly. There are tribal influences once again because I found this beautiful Guatamalian fabric from the 40s at a flea market and I found beautiful, hand embroidered pieces as well. I started with the fabric and then I was introduced to the work of a Spanish artist called David Gomez who created these beautiful portraits. With the combination of the fabric and David's work, the collection immediately became classic menswear with twists of tribal elements and everything came together. fresh and modern. Nicolas Petrou: There is a lot of hand work that we did at the studio here. We spent so much time hand tying knots, hanging charms, fine embroidery. We found the charms, we oxidised them and then used them throughout the collection. We customised the shoes, we hand painted them, changed the laces and used the charms to bring them alive. We work on everything at the studio. Nothing leaves to go to factories so we have tremendous control over everything. It is all handled by us and there is a lot of time and love dedicated to each piece. DD: Once again, the presentation looks amazing. How was it working with Jason Farrer who styled the collection this season? Nicolas Petrou: Thank you! The brand has such a strong aesthetic and identity of its own now and it is dependent upon me. So when other collaborators come in it doesn't alter it too much. It was amazing to work with Robbie and he still loves what we do but he has so many projects. This season was a great transition with Jason. They are all family really. DD: Is there a piece or look that stands out for you? Nicolas Petrou: There is one look that I particularly love because it has everything. The scarf is hand embroidered with all of the classic American pop culture images from Ghostbusters to Pac Man, the shirt is white with patchwork check, the trousers are adorned with the Guatamalian fabric that I found and then of course the hand painted and customised boots. There is just so many layers to it. Nicolas Petrou: I love the intensity of it. Beauty doesn't have to be conventional.